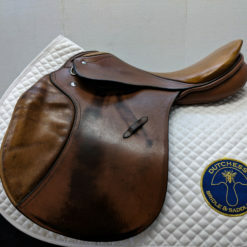 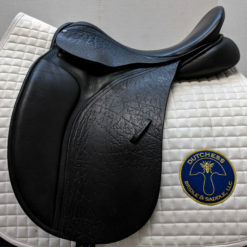 This Stubben Maestoso is a deep seated dressage saddle with “de luxe” leather and a Biomex seat. 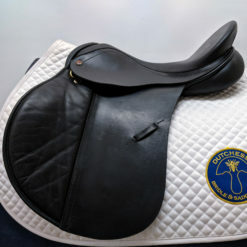 Fitting: MW – The saddle is marked 32 cm but measures 30 cm. 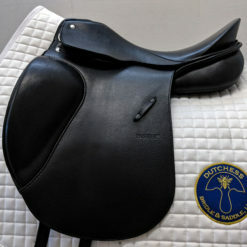 This saddle was narrowed by DBS. 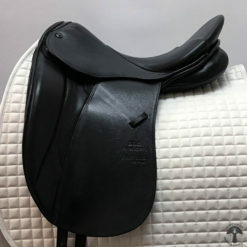 HORSE FIT DESCRIPTION: This saddle would fit a medium/medium-wide horse without hollowing behind the shoulders and has a moderate to level back. 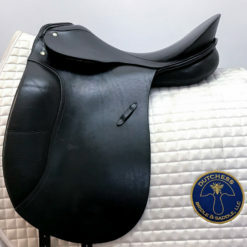 RIDER DESCRIPTION: The seat is moderately deep with a moderately wide feeling twist and moderate width of seat. 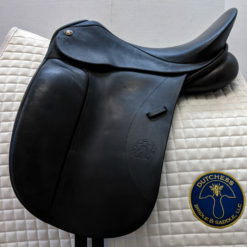 The thigh blocks are relatively large and supportive.